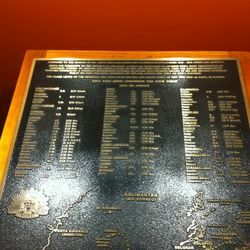 The plaque commemorates those who lost their lives while prisoners of the Japanese in British North Borneo during World War Two. 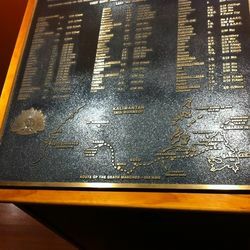 The names listed on the plaque are those from the mid and north coast of New South Wales who died while prisoners of war (POW's) in Borneo. The Japanese conquered British and Dutch Borneo early in 1942. B and E Forces were sent by ship from Changi to Borneo. B Force (1,496-strong) included 145 officers and medical staff. Commanded by Lieutenant Colonel A. W. Walsh of the 2/10th Field Regiment, it left Singapore in the Ubi Maru on 8 July 1942 and after a nine-day journey in poor conditions disembarked at Sandakan. E Force embarked on the steamer de Klerk on 29 March 1943. It contained 500 British prisoners, who disembarked at Kuching, and 500 Australian prisoners, who were sent to Berhala Island (North Borneo). In early June 1943, E Force was moved to Sandakan. Prisoners in B and E Forces included troops from the 2/18th, 2/19th, 2/20th, 2/26th, 2/29th, 2/30th Battalions, 2/4th Machine Gun Battalion, and the 2/10th Field Ambulance. There were four main camps in Borneo : Sandakan, Kuching, Labuan and Jesselton. Of these, Sandakan contained the majority of Australians. Captain Hoshijima Susumi commanded Sandakan Camp. In January 1945 the first forced march to Ranau occurred, and the second in May 1945. Of the 2,500 Australian and British prisoners of war, only six Australians survived these “death marches”. DEDICATED TO ALL THOSE WHO LOST THEIR LIVES IN BRITISH NORTH BORNEO 1942 -1945 UNDER THE JAPANESE. AFTER THE SURRENDER TO THE JAPANESE IN SINGAPORE, A FORCE OF AUSTRALIAN 8th DIVISION POW`s WERE TRANSPORTED TO SANDAKAN, BORNEO. BY JANUARY 1945, FROM A TOTOAL OF 1812, 1023 WERE STILL ALIVE. THEN THE SANDAKAN-RANAU DEATH MARCHES COMMENCED, A TORTUOUS MOUNTAINOUS JOURNEY OF 265KM. TWO SEPARATE GROUPS OF 350 AND 439 LEFT SANDAKAN WHILST 234 VERY SICK POW`s REMAINED. BY THE 15tH AUGUST 1945, ONLY SIX POW`s SURVIVED. 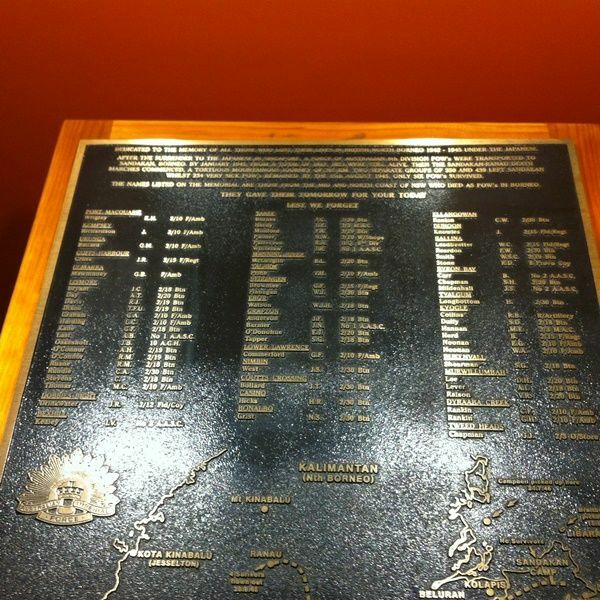 THE NAMES LISTED ON THE MEMORIAL ARE THOSE FROM THE MID AND NORTH COAST OF NSW WHO DIED AS POW`s IN BORNEO.